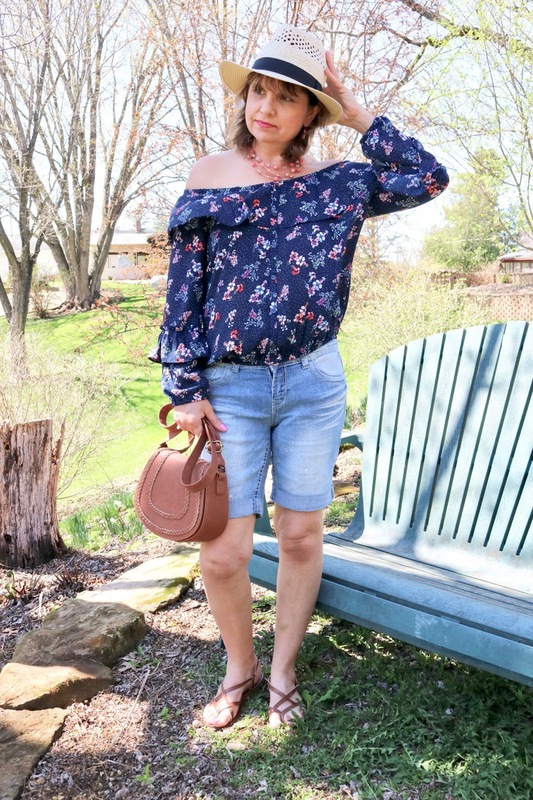 I received this gorgeous off the shoulder top in my 16th Fix. This is the fourth item I received in that Fix. I have already reviewed three items from that Fix HERE and HERE. On Monday I will review the last item in that Fix and also the only item I kept, plus do a summary of Fix #16. The top is by Sanctuary and is called "Glorianna Off The Shoulder Ruffle Detail Blouse. I absolutely LOVED this top! But it was so expensive! Would you believe they were asking $79.00 for this top? That's a bit too much for me, especially since it is not the most practical top in the world and I knew I wouldn't wear it much. As the name describes, the top is off the shoulder and has layers of ruffles on the bust and sleeves. It also has cute little buttons down the front. For photography purposes only I followed the cues on the stylist card and paired the top with distressed Bermuda shorts and sandals. 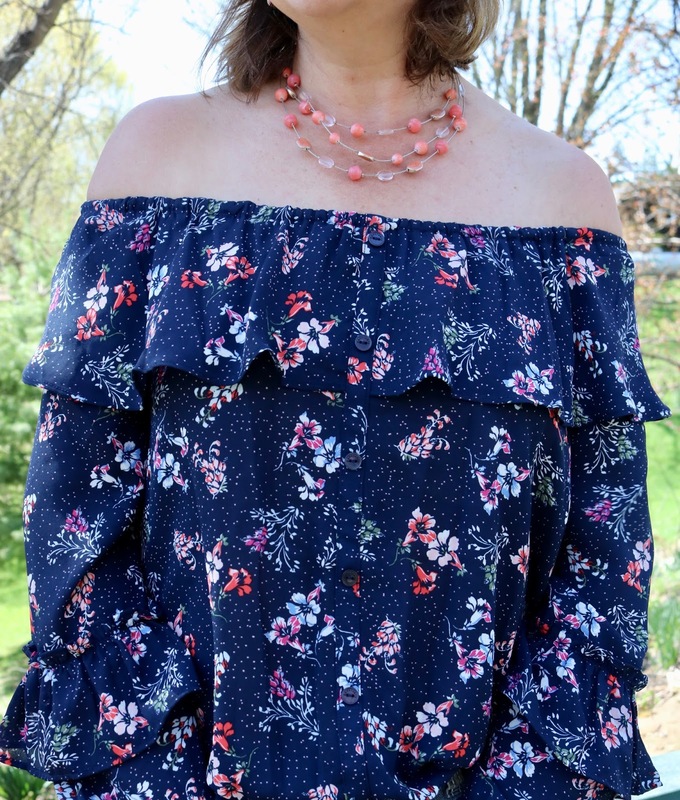 I added a straw hat from H&M, a multi strand coral necklace and earrings, and a saddlebag. All last season I saw women baring their shoulders, but I had not yet joined the party. I always felt a little self conscious showing so much skin, plus I didn't think it was a good look for me since I carry my weight in my upper body. But for some reason, I felt this top was flattering on me. Perhaps it was because the ruffles concealed my large bust and arms. I did wonder how practical it would be since it has long sleeves. I mean, it's cute as all get out, but if it's it's warm enough to bare your shoulders, you certainly don't want fabric on your arms! Excuse my "Farmer's Tan". I usually wear a tank top in the garden so my chest and arms get sun but not much else. Yes, I wear suntan lotion, but I probably should be wearing sunblock. Ah, the joys of gardening: stained knees, bug bites, scratches, and tan lines! Anyway here is a close up so you can see the tiny buttons. And isn't the print so pretty? I love the little white dots. My brown cross body saddle bag was a gift from my daughter (old). For footwear I chose brown flat strappy sandals from DSW (old). I picked up my hat for only $12.99 from H&M when we were in Savannah. I just LOVE it! I couldn't believe the amazing price. So what do you think? Did I make the right decision to send it back? Let me know in the comments below. On Monday's Fashion Post I will share the one item I kept...My husband's favorite....and do a review of the entire Stitch Fix Box #16. You know I love off the shoulder so this is so darling, You look adorable! That is a pretty top, and I definitely think it is flattering on you. This top is just GORG, but yikes to the price tag!!! I really love how your necklace brings out some of the pink toes in it. You always look great in hats! I think I've said this before, but I love how you break up your pieces from StitchFix into separate posts. I just got a pair of shorts from StitchFix and a metal end piece fell off of the cinch waist rope tie on them and I reported it to them and they replaced it within a week and told me to just toss the other pair (I didn't have to send it back). I did send them photos of it. Talk about great customer service! Hope this pair does better! Thanks Carrie! Yes, I decided to try separate posts because covering five pieces in one post just gets to be too much. I'm still not quite happy with my format of these posts, so I'm still working on that. I so agree about the great service Stitch Fix provides. It's a cute look but I understand why you ended up sending it back. Especially the cost, I would pay that much for shoes but never for a shirt. The bermuda shorts look great on you too. I agree! Shoes, a dress or a coat would justify that cost, not a top. It's a pretty top, Amy. And I understand the issue with the OTS and long sleeves. Although since I'm always cold, it would probably work for me---LOL!! On the other hand, I'm a cheapskate, and that's why I haven't tried Stitch Fix yet. Not that I wouldn't pay $80 for a shirt---but I'd want it to be super unique and special. Thanks Jodie! I'm a cheapskate too and it's hard for me to buy things from Stitch Fix when I usually can find better bargains elsewhere. However, it helps me to avoid a style rut by getting Fixes. Otherwise I tend to only buy similar pieces and all my clothes look the same. They also have a lot of unique pieces I can't find in my small town. Thanks Patti! Oh, I know, aren't the bug bites terrible. I cover myself in Deep Woods Off everyday yet I'm still covered in bites. Darling top on you Amy, love the style. I think I am going to buy a pair of denim shorts too. I had a pair that is worn out, and I do wear my white denim shorts. Yours look great! Thanks Jess! Would you believe I got those shorts last year at the end of summer at Walmart for only $3.00? You can wear what you want and you always look so cute and adorable. Thanks for linkup up. you really make a girl wish she could get Stitch Fix. Love this look ( and I have the same top with short sleeves that I found last year. Thanks for linking up and I hope to see you every thursday. I also have a Pinterest board A Labour of Fashion where I am sharing all of the fab looks. Oh, you can't get Stitch Fix in Canada? Maybe they have a similar service. I'll have to check out your Pinterest board sometime.